Golf has been played at Turnberry for well over a century now, starting when Lord Ailsa commissioned Willie Fernie, the professional at Troon, to lay out the first course for Girvan Golf Club in 1901. This 18-hole layout became the No.1 course when the No.2 arrived eight years later. The No.1 course became known as the Ailsa between the two World Wars then the Arran appeared in 1954, shortly after Philip MacKenzie Ross rebuilt the war-ravaged Ailsa. Almost half a century then elapsed before Martin Ebert, working at the time with Donald Steel, reworked part of the old Arran course to form the 18-hole Kintyre layout, with this new course opening at the start of the new millennium. The acquisition of Turnberry by Donald Trump in July of 2014 would then propel golf at the resort to an altogether different level over the next three years and by far the smartest move the new owner made was appointing Martin Ebert to oversee the wholesale redesign of the golf operation. The pitch & putt course in front of the hotel was recreated, the links academy and practice facility was refurbished, a new Cairngorms putting green was installed and the clubhouse was completely renovated before the Ailsa underwent an extensive upgrade. The last piece of the jigsaw to fit into place was the relaunch of the former Kintyre track as the King Robert the Bruce course, named in honour of the man who, raised as a boy in Turnberry Castle (where the lighthouse now stands) at the end of the 13th century, became King of Scots in 1306. Significant modifications were made by contractor SOL Golf to many of the holes – the burn on the 1st was removed, sandy waste areas were established on several holes, a large wetland area was created between the 5th and 13th, trees were toppled to the left of the 7th, and the home green was lowered in front of the clubhouse. As if that wasn’t enough, all the bunkers were overhauled, with fairway traps given a rugged marram-fringed look and greenside sand hazards shaped as traditional revetted pots. Four new holes were introduced on Bain’s Hill, largely reversing the routing of the holes that were once located there. The elimination of the short par four 8th down to the cove by the water’s edge will be a regret to some, while others will rejoice that this blind hole has been abolished. 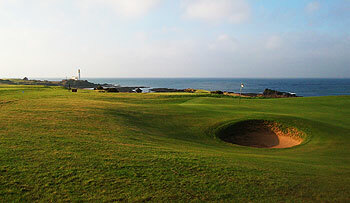 The new par five 8th heads towards the lighthouse, playing to a green that sits above the 12th fairway on the Ailsa. The 9th then returns in the opposite direction and the approach shot requires a heroic carry across the old 8th greensite to a green perched high on the headland. The par three 10th begins a back nine which is now configured with three par fives, three par fours and three par threes. Measuring between 142 yards and 166 yards, this short hole calls for an all-carry tee shot across a sandy waste area to a tricky little green on the other side of a gully. The 11th hole (formerly a par four on the Kintyre but now lengthened to a par five) then heads down the side of the hill – on the same compass bearing as the 8th fairway but never interfering with it – to the flatter part of the property where the closing holes are located. It’s never an easy proposition to play second fiddle to a course ranked near the summit of the World Top 100 but the new King Robert the Bruce course (opened in June 2017) does very well in its support role to a more illustrious sibling. Suffice to say, Trump Turnberry is now a 36-hole golf destination of real substance. Played here in a cold breezy day, after a night of heavy rain, the course is good, maybe a 6 out of 10, however the new holes will need a few seasons for the fairways to improve , very wet in places and a little bare in places. I would put it in the second level of links site courses in Scotland, However the summer green-fee of £120 is way off the mark, having played many courses of a similar level for around the £50 to £60 mark. I attended the opening of the new King Robert the Bruce course a couple of days ago, when Eric Trump paid tribute to architect Martin Ebert for his efforts over the previous three years – during which time he made no fewer than 85 site visits to Turnberry – in helping to transform the fortunes of a golf venue that wasn’t quite in the best of shape when it was purchased. Millions have been invested in the hotel and the golfing infrastructure to raise the resort’s profile to its current all-time high and the arrival of the revamped King Robert the Bruce course is just the latest piece of the jigsaw puzzle to be put into place by its new owners. The old Kintyre course was a decent links layout but it’s now a far better one following a substantial makeover. A lot of the gorse has been removed to reveal sandy waste areas, especially the large patch between holes 5 and 13, where I understand a lot of sand was mined for use around the property during recent course redevelopment work. The course’s eco credentials will certainly now be boosted by this section being designated as a wetland area that will attract a variety of wildlife as it matures. The bunkering is exceptional throughout, mirroring the composition of the bunkers that were recently brought into play on the Ailsa, with ragged-edged marram grass “eyebrow” versions in the fairways and sharper, revetted traps set close to the greens. Fairway turf is firm and fast and the greens are a pleasure to putt on, even if they were running a little slower than some might have expected the other day. The opening seven holes are all solid links holes, played out on relatively flat terrain located furthest inland from the coast. Removing the old burn that crossed the 1st fairway is a big improvement. The new holes on top of Bain’s Hill then really up the ante quite a bit and if they don’t get your pulse racing here then nothing will! A lot of earth must have been shifted to grade the fairway on the new 8th as it heads downhill towards the lighthouse and the green. Because It looks so totally natural, you really have to doff your hat to the architect, the contractor and the green keeping staff for producing such an eye-catching hole that looks like it’s been there for ever. It’s followed by the new 9th, doubling back along the hill to a green that clings onto a rocky promontory, beyond the cove where the old 8th green was located. The fairway narrows considerably before the approach shot has to fly the little bay, across what is now just a sandy wasteland, so it’s rightly rated stroke index 2, even though the prevailing wind is normally behind from tee to green. The new par three 10th then calls for another all-or-nothing shot to the flag, where the tee shot must carry over another large sandy void on its way to finding an elevated green protected by bunkers to the front right and front left of the putting surface. If you manage to card a net “5-4-3” for holes 8 to 10 then you’ve done rather well in my book as it’s a testing little sequence of holes. The extended 11th is now a par five hole and it takes the course routing elegantly back downhill to where the closing seven holes are situated – again, these are all sound links holes, finishing up with the newly lowered green of the left doglegged 18th set in front of the clubhouse. The King Robert the Bruce course, under its old guise of the Kintyre, is currently ranked outside the Scottish Top 50 but don’t be at all surprised to see it make a significant upward move when the national rankings are updated in a couple of months as the spruced up and revitalized version of the old layout is way superior to the one that debuted in 2001. But he wasn't a king ?! Shouldn't be allowed. The second course at Turnberry, the Kintyre, is a fine one in its own right yet is often overlooked by golfers heading to this part of the world. Clearly any course that plays second fiddle to the Ailsa may go under the radar but I would strongly suggest a play at this demanding links if time permits. The greens are modern in design, have greater undulations than the main course and your ball is more likely to kick-off one of the humps and mounds at the green edges into swales and hollows around the putting surfaces. Gorse is also a threat on many of the holes. At the time of playing (October 2016) change is now afoot here with four holes (7, 8, 9 & 10) currently out of play and being remodelled with an opening due in 2017 as the new 'Bruce' course at Turnberry. Holes 1-5 and 13-15 are inside the triangle formed by the old runways. The 16th and 18th are alongside the Ailsa but it is the new holes, mainly higher up from 6-12 that really lift the Kintyre. The 7th is unusual in that it is framed by thick trees. All the trouble is with the second shot on this par four. Stay to the left and use the camber of the fairway. The 8th is certainly one of the memorable new holes. This par four of 306 yards is more or less straight and downhill all the way, but you cannot see the green from the tee. The fairway narrows about seventy yards out where you get a good glimpse of the green in a little cove right on the edge of the low cliff beside the sea. The par five 9th runs high up along the cliff top to an undulating green with the lighthouse and Ailsa Craig in the background. The 10th runs back in the opposite direction. The 11th is a picturesque par four running downhill to a green partly hidden by a thicket of scrub and gorse on the side of Bain’s Hill. The next four holes necessitate some straight driving if you want to stay away from the prolific clumps of gorse. At the dogleg on 17 you need to stay left, away from the burn. The long second shot to the green then needs to avoid the two bunkers at the front left. The final hole is heavily bunkered and is probably rather more of a challenge than its counterpart on the Ailsa. The Kintyre course is rather challenging having particularly narrow fairways and a lot of heavy rough. Being coastal, the wind will be a major factor on your score even on a relatively good day in August. Take plenty of spare balls. The course itself was in very good shape although it was by no means as spectacular as I had imagined. I have played many better courses in Scotland for less money. What was an enjoyable afternoon was marred by the attentions of a course marshal (an American gentleman in a buggy) who spoke down to us and abruptly advised us that we had to play quicker as the group behind us was complaining about our slow play. He failed to take account of the fact that we were continually held up by the group directly in front of us although we were not complaining. We appeared to have been tried, convicted, and sentenced even before he spoke to us. It is of course possible that the players behind us were far more important guests than my party in which case I fully understand and apologise profusely. Played the Kintyre course on Saturday, 31 March 2012 as part of the Bunkered magazine deal. Weather was tremendous – not a cloud in the sky or a breath of wind which probably did not give a fair reflection of how tough this course actually is (although driving straight into a bunker off the 1st tee and carding a 6 to start, I found it a sufficient test being an 18 handicapper!!!). You don’t see much of the sea bar the few holes from 8-11 I think but it is true links golf – plenty of run and firm and fast greens. As for the 8th hole, I don’t particularly enjoy driving off the tee into the unknown (none of us had purchased a stroke saver or were given one by the starter so did not have a clue what lay up ahead) but when I walked up to my ball and found I was five yards off the green in 1, my opinion of the hole changed 180 degrees!! Would like to play it again to pitch my ball down into the green which is surrounded by rocks and waves. Absolutely stunning. Rest of the course was in great condition (bar 4 or 5 bunkers which were G.U.R) and the closing hole is a credit to the course with its undulating green which my playing partner, with 2 puts to win us the match, managed to put straight off the green leaving him a chip back on and us with a costly 7! Would play the course again in an instant. Have never played the Ailsa but if this is the “poor neighbour” then I can only imagine how good it must actually be…. I played the course today with three others, using free green fee vouchers that were given away by a Scottish golf magazine for re-subscribing to their publication. Thirty four quid for a year’s worth of the magazine plus rounds here and the Duke’s – now that’s what you call a bargain! I like playing here in the winter as it’s always in remarkable condition, no matter what the weather’s been like (and the number of muddy bunkers currently marked as GUR shows just how much punishment the course had taken of late). I’ll not repeat what I wrote ten months ago when I was last here; I’ll only add to that by saying three of the most undulating and really interesting greens on the whole course are kept until the last three holes, which I hadn’t noticed last time. Overall, the fairways and greens were in top order though I cannot for the life of me understand why the golf people at the resort insist of placing tees on uneven stances in the fairway, yards in front of the regular tee boxes. Surely, if they want to protect the tees, they can build simple winter tees to the side of the teeing areas. Playing from such offset tees (as happens in the winter at Western Gailes, for instance) can actually enhance the playing experience, unlike teeing off a well-worn, scruffy piece of fairway. That small gripe apart, the Kintyre delivered big time yet again so thanks Turnberry for participating in the “Bunkered” promotion! I almost forgot. At the 8th, where some seem to dismiss the hole as almost too short/too blind to be of any worth, not one of our group managed a par from 302 yards – which I suppose says a lot about us as golfers and/or the merits of a delightful short par four. The ‘second’ course at the Turnberry resort: a harsh or fair view of the Kintyre course depending on your viewpoint. For those who don’t rate the course it is easy to say that the inland holes are much plainer than those with sea views, but that applies to any course. The inland holes present their own challenge; with light rough there is little to stop a well-hit tee shot bouncing through a firm fairway and into the unforgiving but colourful gorse. The 6th offers a very good green complex which is hard to hit and hold. The 6th and 7th provide the golfer with charming views and give the golfer an indication of the quality of the upcoming stretch. The middle stretch offers great quality from the 8th to the 12th. The 8th may split opinion but holding the green that slopes away from you is a great challenge in a beautiful golfing amphitheatre. The views from this part of the course are also some of the best on the resort. The course regains its more inland look from this point onwards and then concludes with a strong finish in the shape of 16-18. The 16th can prove tricky with the green also sloping away from the tee. To my mind having so many strong holes more than justifies the course’s middling ranking. Well, if this is a seconday course, imagine how good the primary course is. The first 6 holes seem more of a parkland than a links course, but from 7 to 12 you find the best holes of the course, with 8 and 11 the highest notes. 8 is a short reachable par 4, but taking the rist will lead to massive scores if you miss, while 11 is the only hole on the Resort in which you can take a picture teeing off with the Lighthouse and ailsa Craig in the same line as your swing (see my pic there). The Course plays tough and cannot be taken only as a friendly play, if you stand on first tee make sure you want to play because it challenges you to the limit. It cannot be considered a "must" but if you are there, why not take the chance to drive 8th??? ?